The specs for Microsoft’s Project Scorpio have been officially revealed. Microsoft invited Eurogamer subsidiary, Digital Foundry to Redmond to take a peek under the hood of the Scorpio. What they revealed was the most powerful gaming console on the planet. Hyperbole aside, Eurogamer still only describes Project Scorpio as “a mid-generation refresh design.” But Kotaku says, "Scorpio appears more like a new console generation." We already knew that the Scorpio would operate at six teraflops, 1.8 above the PlayStation Pro. And despite the fact that it will hit shelves a year or more after the PS Pro, the truth is that both the PS Pro and the Scorpio have and will be released in the middle of the typical lifespans of the PlayStation 4 and the Xbox One. Furthermore, although the power of both consoles surpasses the previous iterations, the goal for both companies was not to create the next generation of hardware but to upgrade the current-gen boxes for 4K displays. No doubt the debate will rage on and on, but what we now know for certain is that Microsoft has one-upped Sony with Project Scorpio. It did not blow the PlayStation Pro completely out of the water, but there are significant improvements. However, console races are not solely about the hardware, and Kaz Hirai and crew currently have a big lead in the numbers and with exclusive titles. The Gates team needs to bring it, if they want to catch up and looking at the stats, it does look like they are bringing it. The soon to be “new Xbox” has eight custom x86 cores that run at 2.3 GHz. The PS Pro uses eight Jaguar cores running at 2.1 GHz. Slight increase in processing speed, but pretty much the same architecture. While CPU performance is important, after all, it is the engine that drives the machine; gamers care more about the GPU. The GPU in the Scorpio is “40 customized compute units at 1172 MHz.” Compared to the Pro’s 36 GCN units chugging along at 911 MHz, you can begin to see why the Scorpio is going to be pushing six teraflops. Microsoft is also upping the ante in the RAM department by including 4 GB more GDDR5 than the PS Pro’s 8GB. The extra RAM is probably not necessary for most 4K applications, but having extra RAM never hurts, and it gives developers more room to play. Memory bandwidth is actually more relevant than the amount of RAM, but Project Scorpio has that covered too. The folks in Redmond told Digital Foundry that they would be capable of 326 GB/s memory transfer. Compared to Sony’s best offering of 218 GB/s, this is a significant edge for the console. The hard drive is going to be 1 TB, just like the PlayStation Pro, but the Scorpio will have a 4K UHD Blu-ray optical drive, which is obviously better than Sony’s standard Blu-ray used in the Pro. Why Sony did not spend a few extra bucks for a 4K drive is anybody’s guess. Looking at the specs is all fine and good, but all anyone cares about in any gaming console is how well it runs. In this case, the Scorpio operates pretty well, as you can see above. According to Eurogamer, the box is capable of running Forza 6 in 4K at 60 frames per second without a hiccup and still has cycles to spare. 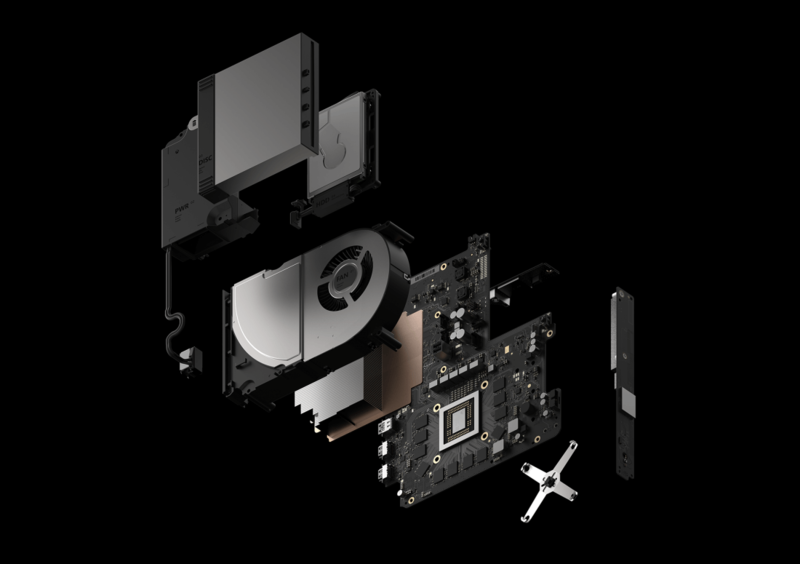 While Project Scorpio certainly packs more horsepower than anything else on the market and does have some significant improvements over the PlayStation Pro, it still being called “a mid-generation refresh” by some. It is sure to make some sales, but like Sony customers, many will probably wait for the “real” next-gen hardware to come out. How about you? Are you going to stand in line for the Scorpio when it is released? Let us know in the comments.